I read your article about Palmer chocolate being sued for its “Too Tall” bunny. 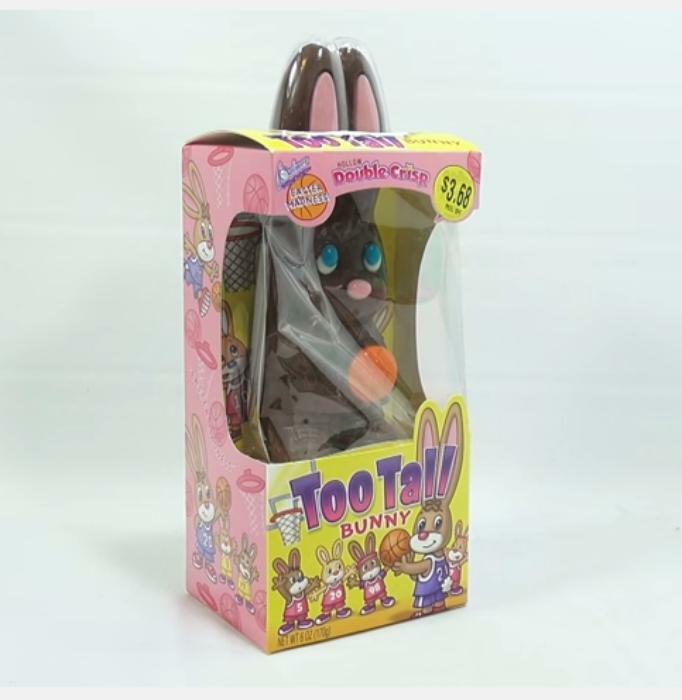 The “Too Tall Bunny” is a hollow chocolate rabbit sold in a cardboard box topped by a clear plastic dome. That dome is part of the gimmick: the bunny's chocolate ears poke out through the top of the box and into the dome, because the bunny is “Too Tall” for its box. Except it isn't; the box has a false bottom, and if you open the package and remove the chocolate bunny, you'll see that the bunny, ears and all, is actually a bit shorter than the box. Did you notice my mistake? I don't feel too bad about it since I'd bet thousands of consumers have made it too. The bunny not only isn't all that tall, it's not chocolate either -- although if you go to the R.M. Palmer Co. website and click on "Hollow Chocolate," you'll see "Too Tall" and quite a few other bunnies listed. [I]f you look carefully the bunny is labeled as “Double Crisp”. Palmer Double Crisp bunnies are not in fact real chocolate they are fake chocolate (compound chocolate). They use the term “Double Crisp” to fool consumers into thinking they are actually real milk chocolate. It appears that even you a seasoned consumer affairs reporter was fooled. Indeed I was. And Mark's correct in pointing out that Palmer's Double Crisp candies are not actually made of “chocolate,” as it is defined by the Food and Drug Administration. The FDA lists standards for various types of “Cacao products,” including “breakfast cocoa,” “cocoa,” “sweet chocolate,” “milk chocolate,” and more. Basically, to legally qualify as real chocolate (as opposed to a “chocolaty” or chocolate-flavored product), a minimum percentage of the candy must come from actual cacao beans, including fat derived from genuine cocoa butter. On the other hand, Palmer doesn't exactly go out of its way to make the distinction. On its website, the Reading, Pa., company says: "R.M. Palmer Company has been crafting seasonal chocolate novelties since 1948." 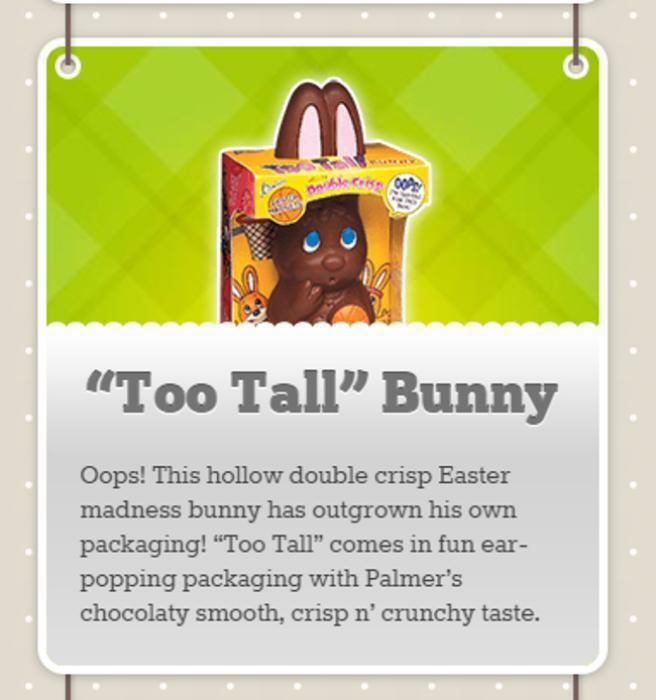 It promotes "Too Tall" and its other bunnies as featuring "Palmer's chocolaty smooth, crisp n' crunchy taste." While the labeling on the product may be correct, you do refer to your products as "chocolate" on your website and, presumably, elsewhere in sales and promotional material. We are preparing a follow-up story and would appreciate your clarifying whether all of your products are "chocolaty" as opposed to "chocolate" and, if so, whether you consider it proper to refer to them as "chocolate" on your website and, presumably, other marketing materials. The company did not respond to our email.